"It's been said that the lard is what produces the traditional taste. However, if desired, butter or margarine may be substituted for very satisfactory results." Sift flour, sugar, baking soda and salt together into a bowl. Cut in the lard until mixture resembles cornmeal. Add egg and almond extract. Mix well. Roll dough into 1-inch balls. Set them 2 inches apart on an ungreased cookie sheet. Place an almond on top of each cookie and press down to flatten slightly. Bake in the preheated oven until the edges of the cookies are golden brown, 15 to 18 minutes. 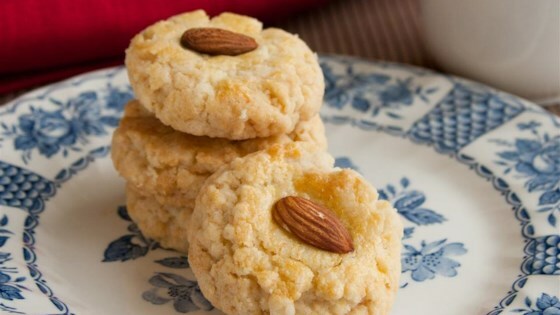 great recipe, the cookies taste exactly like those i bought in chinese bakery, and easy to make too. i did increase the amount of almond extract to 3 tsp though. These cookies are so good, you can't stop eating them! I didn't have lard. We used half butter and half Crisco. They were still awesome!